GenealogyBank has released a new eBook about descendants of the Mayflower passengers. Genealogists are constantly looking for their relatives, researching and documenting how each one is related and fits into the family tree. Mayflower descendants have been recording their connections to the Mayflower Pilgrims in America’s newspapers from the 1600s down to today. This eBook is a roll call of thousands of these Mayflower cousins who have been recorded and documented in newspaper articles over the past three centuries. It is a quick way to find your Mayflower cousins. Just as the Mayflower Compact was signed on 11 November 1620 on board the Mayflower and William Bradford recorded each of their names in his journal, the names of their descendants were preserved in America’s newspapers from the earliest newspapers down to today. For example, here is an obituary of Peregrine White who was born on board the Mayflower in 1620. 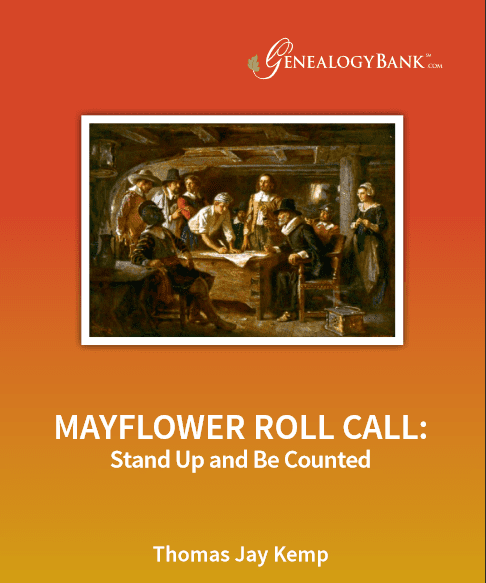 Mayflower Roll Call: Stand Up and Be Counted brings together thousands of these newspaper articles found in GenealogyBank’s Historical Newspaper Archives. Each entry in the eBook gives the name of a descendant, the names of their Mayflower ancestors, along with the newspaper citation so that genealogists can quickly look up each article in GenealogyBank to verify and document their family tree.